Oakmont of Folsom was very nice and and so were the people there. The place was very clean and everything was new. The staff was above and beyond friendly. The residents were happy. Oakmont of Folsom was not too far from where I live, and it had a bed available and was clean. The people are truly caregivers, provide 24-hour care, and are responsive to any requests. The food is amazing. I wouldn’t mind living there, so I thought that it was OK for my dad. They have a garden in the memory care section. My dad was a farmer who grew vegetables, so that was important to him. They have an aviary there, too, so you can watch birds. There's two activity directors, so something is going on every minute of every day. They’ll take a group out to a festival or something that’s going on in the community as well as do the usual inside activities, like music and games. They have an upright piano and a grand piano, too. This new community provides another option in the Folsom area that is close to Hwy 50 and just minutes from Sacramento. Oakmont of Folsom is located just off the main road through town, set back in an area surrounded by Oak trees and wildlife. The front entrance is both grand and inviting with ample room for unloading and picking up residents. Food and activities are in abundance with variety and options that provide for independent choices. Resident rooms are spacious and well appointed with room for personal furniture. The community is new,clean and well maintained. 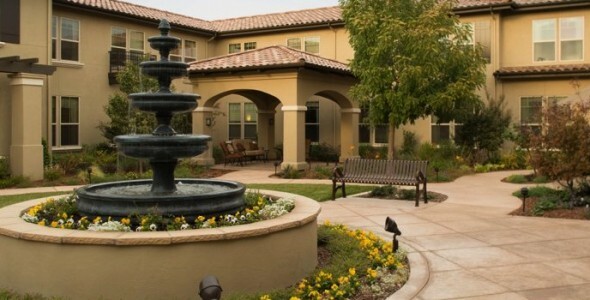 Oakmont of Folsom is the newest luxury assisted living and memory care community in Folsom. This community is brand new and is stylishly decorated with five star services and amenities. This beautiful community offers the best in comfort and style with complimentary concierge service to help you plan your day to its fullest. Their Executive Chef makes each meal a fine dining experience. Their staff is experienced, professional and most importantly focused on making their resident's life as comfortable as possible. The best way to get to know a community is by scheduling a tour. See the facilities, meet the staff and residents, and get a feel first hand what it's like to live at Oakmont of Folsom Assisted Living. You will find yourself surrounded by friends, luxurious accommodations in an atmosphere of timeless elegance at Oakmont of Folsom. Located in Folsom, California near conveniences such as shopping venues, local houses of worship and healthcare providers our consciously designed community brings out the best in our residents, ensuring a full life. Oakmont Senior Living has been recognized as a leader in the retirement industry. We are committed to both comfort and quality and consistently deliver luxury services at the more than 40 retirement communities we've developed. From the second you step foot onto our lush campus and walk through our sunlit lobby, you'll be surrounded by the beauty of a consciously designed community. Wide windows, open and stunningly-lit hallways, handsomely-appointed furnishing and stylish fixtures are among the first things noticed, but that's just scratching the surface of what Oakmont of Folsom has to offer. With a unique assortment of spacious apartments, our residents can decorate their home to their heart's content. Of course, there's so much more to take advantage of at a luxury retirement community. Stop by our health and wellness center to keep fit or stroll over to the activity center and indulge in all the on-site workshops you desire. In addition we offer restaurant-style dining prepared by a first class chef, a movie theater, fitness center, salon, day spa, gardens and walking paths. Luxury at Oakmont of Folsom isn't limited to the design and character of our community, but permeates our entire culture. We know that design is only one aspect of senior living, and the other part of the equation is the quality of staff and services offered, which is why no detail is spared when it comes to care. You can expect weekly housekeeping, dedicated concierge, valet service and an emergency call system with access to professional staff 24 hours a day. We are passionate about service and are available to assist with bathing, dressing, grooming, diabetic care, medication management, incontinence care and transferring support. Those who suffer from memory impairments will also benefit from our Traditions memory care program. Our programs are individually tailored to provide the highest quality of life for your loved one, and include specialized activities based on music, sensory and tactile stimulation. We invite you to visit Oakmont of Folsom where you'll find a new home to enjoy the best years of your retirement.